One Man and A Brush Painters Alpharetta GA is proud to have been serving the City of Alpharetta, GA since 2005, the Technology City of the South, from the North Georgia Mountains to the Chattahoochee River. We are residential Alpharetta painters offering only the highest quality home improvements, and so much more. Each of our house painters Alpharetta GA are skilled craftsmen with a minimum of 5+ years experience. One Man and A Brush painting company Alpharetta continuously strives to provide you with a value driven competitive estimate, however we’ll not sacrifice quality or short cut the work simply to give you a lower price. We work hard because we want you to know we are your trusted residential painting professionals for 10 years since 2005. We’ll continue to offer homeowners the highest quality, yet affordable interior & exterior painting in Alpharetta for years to come. One Man and A Brush house painting in Alpharetta services don’t end on the last day of your home project. 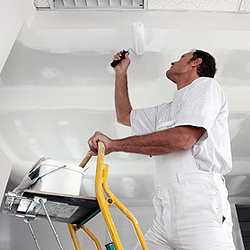 At the end of every day, our Alpharetta painting contractors make sure to clean up our work areas. We also provide a free touch-up service and a 2-5 year paint warranty. If you are looking for professional house painting by pro painters Alpharetta GA then please call One Man and A Brush painting contractor Alpharetta for exterior & interior house painting Alpharetta GA at 678-368-5115 or Schedule Your Estimate Appointment Online.